Didn’t get the new compressor lines all plumbed up over the weekend like I had hoped, but the hard part is done at least. Should be all finished soon, then we can get back to working on the Saab. I thought I had it all mapped out, but had to make some changes to the plumbing layout in order to keep the drip tees easily accessible. Factored in some slope to the lines in order to drain any condensation towards those drip tees, too. Going to have about 50 feet of pipe from the compressor to the water separator/filter and regulator before it ties into the hose reel. Also decided to run another line next to the workbench, to have a blow-nozzle handy. That run will end up being about 20 feet from the compressor. Trying to avoid having to install a drier. 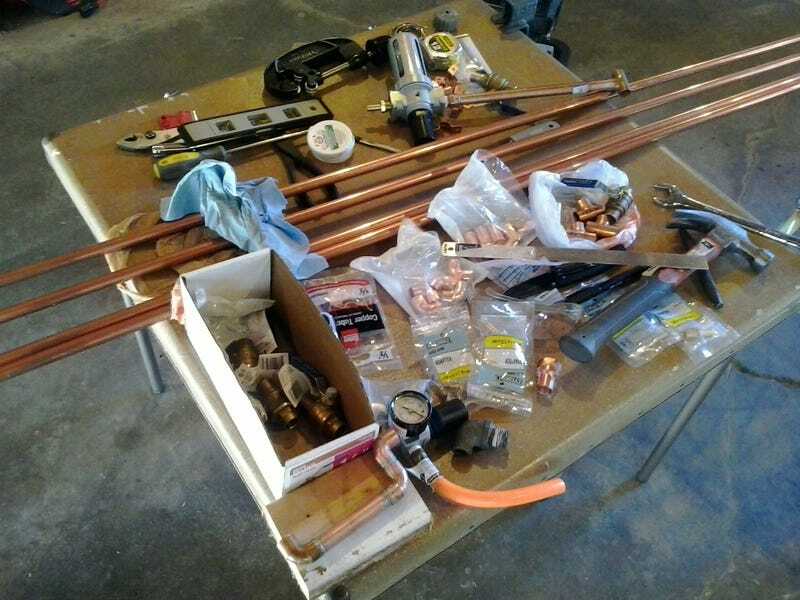 I’m planning to cut some of the old orange PVC hose for repurposing as flex hose at the compressor and hose reel. It’s almost uselessly stiff in the wintertime, but should do just fine for short flex lines to help keep vibrations out of the hard lines. I can cut it to custom-fit where I need it, so that there are no kinks or sags, just smooth comfortable transitions where I need them. Also decided to move the hose reel. Decided I wanted it tucked away up a little closer to the ceiling. I’m only relocating it about a foot or two away from where it should have been installed the first time, but this will save having to duck underneath it while walking through, so I think it’s worth the effort. I’ll adjust the hose stopper to keep it within easy reach, and direct the hanging part to a hook on the wall to keep the walking space unobstructed. It’s coming along well, just slower than I anticipated. Really looking forward to the finished product!